Polkadoodles- Sparkle, Bling or Gem-- I'm thinking that big strip of silver qualifies as sparkle! -- I saw the orange and black first so I took the color combo and used the sketch! I know thats a lot of challenges but wouldn't ya know using Halloween colors this time of year makes it really easy!! Pop back in the next few days to see that gift that goes with it!! 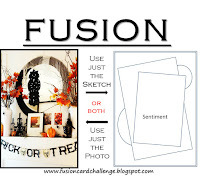 What a fun way to make a personalized card ... so very glad you joined us at Fusion Card Challenge. a great card for the biker! love the silver piece - thanks for joining us in the Fusion Challenge! What a great way to personalize this birthday card for your brother in law. He's going to love this!